Bernhardt has a horror of lost moments—the time when most people dawdle, think about nothing at all so far as they can manage it. The key to this trait of her character may be discovered between the lines of her talk with an interviewer last spring. Bernhardt today is between fifty and sixty years old, and yet, even in the pitiless light of the sun, and without the friendly aid of her stage make up box, she appears to be little more than half her age. She was only fifteen when she began to study for the stage. But it was not the fascination for the footlights that caused her to exchange the convent school in Versailles for the Conservatoire of Paris. Painting was the art she loved, and loves yet, though she has had little leisure for study. To gain admittance to the Conservatoire, she was of course obliged to undergo an examination in elocution. She selected a fable from La Fontaine to recite, and did it so well that she was asked to do something else. But by this time her nerves had become unstrung, and she disgraced herself by bursting into tears. Her first piece, however, had won the day for her. She has a strange reason for refusing to play at the Gymnase. In her early days she was assigned to a part there in a comedy, in which she was continually called upon to burst into laughter. This was so decidedly out of her line that she left the theater for good at the close of the first performance. The letter announcing this abrupt departure was brought to the director of the Gymnase while he was entertaining Sardou at breakfast. His annoyance was palpable. “What is the matter?” inquired Sardou. Recently Bernhardt has taken upon herself the management of The Renaissance, one of the best known theaters on the grand boulevards. But she is not going to allow this to interfere with her foreign tours. She comes to America again this season, opening in New York at Abbey’s in January. The past season she has spent in Brittany, giving free play to her whim of living, as nearly as possible, the life of a peasant, in order to fit herself, by complete rest from her usual routine, for her long journeyings. It was the talk of two hemispheres when Bernhardt broke loose from the Francais. She felt oppressed by the limitations of a societaire, even of so august a body. Permission to act in London was refused to her, but she went, nevertheless. This was in 1879, and one hundred thousand francs was the forfeit she was obliged to pay; but the fine was a mere bagatelle to her earnings as a free lance. Finding that money was no argument with her, the chagrined Parisians thought to find their revenge in the social snubbing they felt convinced the prudish Britons would administer to the woman who had taken almost a fierce delight in setting conventionalities at defiance, and whose reputation had preceded her in the shape of stories that she never took the trouble to deny. But here again they were disappointed. Gladstone himself thought it not beneath him to seek out the artist whose power none could dispute, and tell her with his own lips of the spell she had wrought. 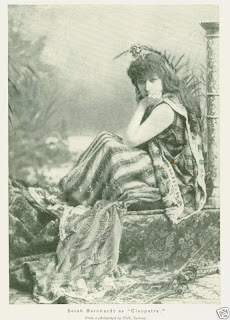 Her first appearance in the United States was made at Booth’s Theater, New York, on the 15th of November, 1880. The interest in the event recalled the days of the Dickens readings, for—as had happened when the famous novelist came here—messenger boys stood shivering in line all night long in order to secure places as soon as the box office should open on the first day of sale. Her second visit was made eleven years later. As to her plays—and Bernhardt evidently prefers to appear in those known by the name of the heroine—she has declared that the greatest of all feminine parts is that of Lady Macbeth; but she has special preferences for the last act of “Camille” and the third act of “La Tosca”. There is a scene in “Olivia,” however, which she considers the grandest act ever written. Bernhardt is so realistic in her great scenes that they affect herself as strongly as they mover her audiences. After she kills Marcellus in “Theodora,” she can do nothing but sob upon reaching her dressing room. Or, if she does not weep, she is seized with a hysterical attack, which, as she puts it herself, is much more unpleasant for those around her. 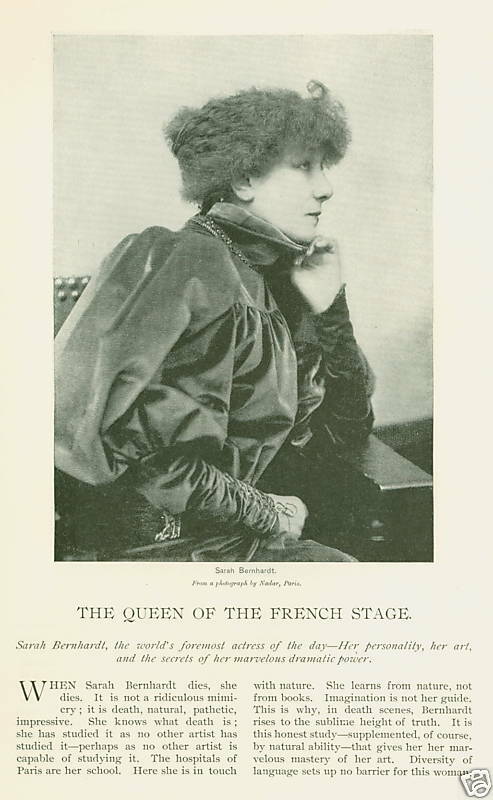 She would not be Bernhardt if she were not as theatrical off the stage as she is on it. Her every gown is the product of a studied effort, and yet when she speaks, in that voice which one of her critics said would silence animate nature, all incongruity is sunk in the enchantment of hearing her discourse. And Bernhardt can talk on any subject, from theosophy and politics to the price of seats at theaters and the best breed of dogs. She loves all dumb animals, and it is not merely the desire to be eccentric that causes her to make pets of the two tame jaguars she brought from South America, and with which she plays on the rugs of her home on the Boulevard Periere. The house is furnished as a studio, with all sorts of bizarre and fanciful decorations, and Turkish attendants to lend the picturesqueness of their costumes to the general color effect. As to the mistresses’ apparel, a recent caller found her in a long breakfast gown of white, covered by a fur lined robe, also of white, which swept majestically over the polished floors and tiger skins. Another visitor describes her as a fascinating figure clothed in amethyst velvet. Her jewels are of the most costly beauty. Her latest fad is ceramics, and she describes her handiwork—from the fashioning of the clay to the firing in the oven—with the enthusiastic delight of a girl. Sculpture is the one thing of which she has made a serious study, and yet her pictures have frequently been hung in the Salon where, of course, they have been the observed of all observers. She can shoot well enough to bring down a moose, and has even taken a noon observation for the captain of a steamship. After all, it is Bernhardt’s self that has made her the mistress of the stage. Other women have played the same parts, and perhaps, in a measure thrilled those who beheld. This Parisian genius possesses the gift, but rarely bestowed, of being the character she assumes, and yet at the same time so infusing her own personality into it that the playwright himself must stand amazed at the marvelous force of his own creation. And yet it is not his; he has but built the framework on which this paragon of painters from life has sketched a masterpiece. Originally published in Munsey’s Magazine—December of 1895.